The closed door meeting in the president's official residence lasted nearly 6 hours. 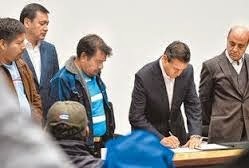 A representative of the parents of the 43 disappeared Ayotzinapa students has said that the agreement reached between families of the missing students and Mexico President Enrique Peña Nieto is “insufficient”. 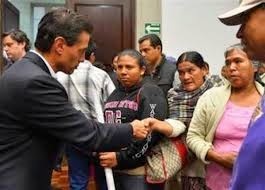 On Wednesday the parents arrived in three buses to Los Pinos – the official residence of the president - for a near 6 hour closed-door meeting with President Peña Nieto; Interior Secretary, Miguel Angel Osorio Chong, and Attorney General Jesus Murillo Karam. The parents refused to make the meeting public. At 9pm, Peña Nieto held a press conference to pronounce the results of the meeting. The families refused to participate in the conference. Nieto said that a ten point list of demands was outlined stressing elements such as the creation of a joint committee to strengthen the investigation comprising the Attorney General’s Office, the Interior Ministry and a delegation of family members of the Ayotzinapa students. The president also pledged support to the families of the three youth who were killed by municipal police in Iguala on the night of September 26th. Finally, he underlined the formation of a working group to support the network of rural teacher-training colleges or the Escuelas Rurales Normales, which Ayotzinapa is part of. Earlier in the day Felipe Jesus de la Cruz, parent of one of the missing students and an elected spokesperson of the group said they were heading into today’s meeting with deep skepticism of the authorities and their investigation. They presented three primary demands to the executive branch. One, that the authorities change the direction of their investigations basing their search on finding youth who are still alive, rather than searching for clandestine graves. The second demand is for the authorities to halt what the parents call a campaign of criminalizing the network of teacher-training colleges by labeling them as hubs of guerilla groups or organized crime. 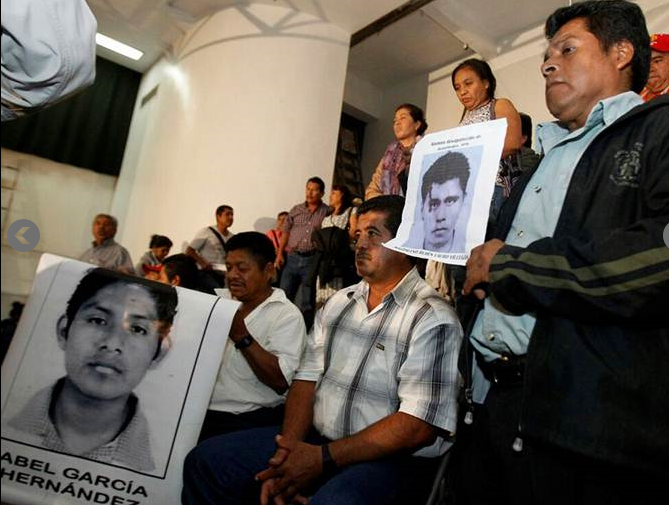 Finally the families are demanding reparations from the state for the disappearance or loss of their loved ones. I am amazed EPN did not send in his henchmen to run the buses off the roads, have the police and military kidnap the families, turn them over to the neighborhood cartels and have them all shot to death. Simply surprised is all! Does anyone know anything about Mireles...no one is talking about him any more.